Note: This post is the thirty-seventh in a series. Click here for the full listing of the series. Envy is considered one of the seven deadly sins, the ten commandments came out strongly against it and if Wikipedia is to be believed, it doesn't go over well in Islam or Buddhism either. So what's so bad about envy? Joseph Heath has an excellent essay on the topic of envy which can be read here. "The Pareto principle states that if a proposed change in the condition of society makes at least one person happier, and does not make anyone else unhappy, then that change should be regarded as an improvement. This principle forms the conceptual core of modern welfare economics, and exercises enormous influence in contemporary discussions of justice and equality. It does, however, have an Achilles’ heel. When an individual experiences envy, it means that the happiness of others itself becomes a source of unhappiness. As a result, envy has the potential to block any and all Pareto improvements. Making one person better off will automatically make someone else worse off, so there will be no point talking about efficiency gains." Envy translates your gain automatically into my loss much in the same manner that a positional externality does. However, whereas nothing much can be done about a pure positional externality, envy can be reduced by the virtue of a people who will not allow themselves to feel worse simply because someone else has made a gain. "Thus John Rawls assumes that rational agents behind the veil of ignorance 'do not take an interest in one another's interests.' Similarly, David Gauthier excludes any 'tuistic' preferences from consideration in his bargaining theory." "Imagine in a situation in which my neighbour acquires an air conditioner. This is a purely private transaction between himself and the merchant. Unfortunately, as a consequence of this purchase, I may find myself, on sweltering days, glaring enviously across the yard, resenting the comfort enjoyed by my neighbour and his family. Does this undermine the win-win character of the transaction between the neighbour and the merchant? There is a very strong moral intuition which suggests that, in this sort of case, the loss of welfare that I experience from my neighbour's new acquisition should not count as a consideration that speaks against the transaction. On the other hand, the air-conditioner might also make a lot of noise, which keeps me awake at night. Then we might not want to regard the purchase as purely a private matter between the neighbour and the merchant. I become an unwilling participant, and my loss of welfare, it seems, should count for something. Economists would say that in this case the transaction creates a 'negative externality.' Thus when we talk about markets, the 'laundering' of preferences normally occurs in the decision that we make about which external effects of a transaction to treat as 'externalites' – and thus as part of the 'social cost' of an action." The problem as Heath notes, is that "Despite the intuitive attractiveness of these distinctions, it is difficult to formulate a precise articulation of the underlying logic." Heath spends the bulk of his paper working through the subtleties of trying to make that formulation and how to form policies that might recognize the value of people's legitimate concerns about their relative standing, while at the same time not providing legitimacy to simple envy. It's well worth reading, but too complex to summarize in detail here. "The reasons for wanting to launder out envy from our social welfare judgements are for the most part sound. It is very important that we be able to identify win-win transformations in social outcomes, without being held back by people who get upset at the mere fact that somebody else is winning. The problem is that our preferences cannot be separated cleanly from one another, simply because our judgments – the very concepts that we use to articulate our needs and desires – have a deeply relative character. If all of our desires were of this type, and everything were relative, then there would be no problem. The human race would have been locked into a state of hedonic homeostasis since its inception. The problem is that the relativity of our desires admits of degrees. As a result, it is possible to achieve Pareto improvements by shifting resources out of areas that have the structure of a zero-sum game, and into areas where improvements in absolute welfare level are still possible." The more general point I want to make is that the commercial, trade based system functions best when people and their preferences are independent of one another. This post was an example where people's welfare was negatively correlated (your gain is my loss or your loss is my gain (i.e. schadenfreude)). There can be other issues when people's welfare is positively correlated which I might get into in a later post. To some extent, this is just re-covering earlier ground on the problems caused in markets by negative and positive externalities, but I though it was worthwhile showing how these externalities can have a basis in human emotion as well as in the physical world and that, where human emotion triggers negative externalities, it has been suppressed using moral means as far back as the Book of Exodus when God told his people, "You shall not covet your neighbor’s house; you shall not covet your neighbor’s wife, or male or female slave, or ox, or donkey, or anything that belongs to your neighbor." Paul Kedrosky links to a McKinsey report that contains some information I've been looking for for a while now. In particular, this chart, showing total debt as a percentage of GDP for Canada (click to enlarge). ... which echoes concerns recently expressed by the Bank of Canada about household debt in Canada. 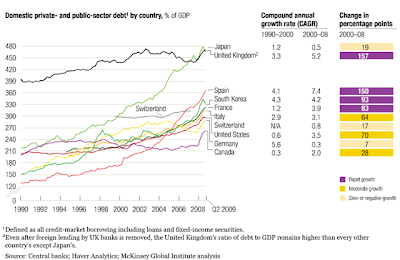 Anyway, it's nice to finally have at least an estimate of the path of total debt/gsp in Canada. I've been reading commentary on the recent U.S. supreme court decision (full text) that the government can't ban corporate spending on candidate elections because this is a violation of corporations' constitutionally protected right to free speech. Aside from the (in my opinion) craziness of the decision itself, what I've noticed in the commentary is a striking inability of commenters to distinguish between the commercial and the government (guardian) realm. Do you believe the FBI has the right to enter and search the offices of the ACLU without probable cause or warrants, and seize whatever they want? The only thing stopping them from doing this is the Fourth Amendment. If you believe that corporations have no constitutional rights because they're not persons, what possible objections could you voice if Congress empowered the FBI to do these things? Could Congress pass a law tomorrow providing that any corporation - including non-profit advocacy groups -- which criticize American wars shall be fined $100,000 for each criticism? What possible constitutional objection could you have to that?" Notice that all the question Greenwald asks relate to commercial matters. He doesn't ask if corporations should be eligible to vote, to hold office, to serve as judges, or to lead the army. Why is it that so many people who clearly do think books and magazines and talk radio shows enjoy unambiguous constitutional protection, despite being corporate funded or operated, are simultaneously absolutely sure that paid broadcast spots are in an utterly different category? ... My hunch is that it has something to do with the imagined audience. No, it's because the first group falls under the category of art, whereas commercials, much like corporations, are under the category of commercial activity - which should be kept separate from the political world as much as possible. Very rarely in what I've read on the case (and then only in the comments to posts) has anyone made the simple point that a corporation is a commercial entity, created for a solely commercial purpose. Therefore it makes perfect sense that this commercial entity should be kept out of the political world as much as possible. Yes, a corporation should have property rights, and be protected from theft, but that doesn't mean it should have full political rights as well, there's no slippery slope and there is a clear line to be drawn. Even if people haven't read and been persuaded by Jane Jacobs' argument that systematic corruption is the inevitable result of mixing commerce and politics, I feel that we used to have a stronger intuitive moral sense about these things. Update: Here's an honourable exception, Justin Fox. "VANOC confirmed today that it has exceeded its goal of ensuring at least 30 per cent of the seats at high-demand events are available to the public for purchase ― the highest ratio in recent Winter Games history"
30% of the tickets available to the public? Wow, that's really impressive! Note: This post is the thirty-sixth in a series. Click here for the full listing of the series. Today's topic is a particular type of negative externality known as positional externalities. They're called 'positional' because they relate to areas where what matters is one's position relative to how others are doing, as opposed to some absolute measure. i.e. Trying to win the gold medal rather than trying to set a world record. Positional externalities refer to a special type of externality that depends on the relative rankings of actors in a situation. Because every actor is attempting to "one up" other actors, the consequences are unintended and economically inefficient. One example is the phenomenon of "over-education" (referring to post-secondary education) in the North American labour market. In the 1960s, many young middle-class North Americans prepared for their careers by completing a bachelor's degree. However, by the 1990s, many people from the same social milieu were completing master's degrees, hoping to "one up" the other competitors in the job market by signalling their higher quality as potential employees. By the 2000s, some jobs which had previously only demanded bachelor's degrees, such as policy analysis posts, were requiring master's degrees. Some economists argue that this increase in educational requirements was above that which was efficient, and that it was a misuse of the societal and personal resources that go into the completion of these master's degrees. Another example is the buying of jewelry as a gift for another person, e.g. a spouse. For Husband A to show that he values Wife A more than Husband B values Wife B, Husband A must buy more expensive jewelry than Husband B. As in the first example, the cycle continues to get worse, because every actor positions him or herself in relation to the other actors. This is sometimes called keeping up with the Joneses. One solution to such externalities is regulations imposed by an outside authority. For the first example, the government might pass a law against firms requiring master's degrees unless the job actually required these advanced skills. Competition for positional goods is a zero sum game, in that any gain made by one person is exactly offset by losses to another. If I move up from having the third nicest house on the block to having the second nicest, someone else has moved down from second to third. Therefore, whether competition in these areas is beneficial to society or not depends on whether any positive side effects from the act of competition outweigh the resources devoted to an area in which no gains can be made. In 'The Efficient Society' Joseph Heath recounted a story of native leaders who competed with each other on the basis of who could afford to destroy more of their own possessions. This is an extreme case of competition for status with negative side effects. Generally, there will be a greater gain to society if people focus on achieving absolute improvements rather than relative ones. For example, innovation that allows every house on the street to have indoor plumbing is more valuable than everybody on the street competing to see who can have the biggest house. To the extent that people concern themselves with status rather than looking for improvements to their lives that don't involve comparison/competition with others, greater gains will be made, because this approach will reduce the presence of negative positional externalities. As you know, as part of our economic action plan, one of the things we’ve of course done is to step up government advertising. One of the purposes of that has been to support media outlets during the recession that have been particularly hard-hit. In the spirit of the posts on economic issues from my series on ethics, here's an interesting article by Economic Nobel Prize WInner Robert Solow (to some extent, a review of "How Markets Fail: The Logic of Economic Calamities", by John Cassidy). Solow covers a lot of the ground I've covered here on rationality, perfect competition, (Pareto) efficiency and market failure, but it's interesting to me that he does it entirely without once mentioning the concept of ethics. "I have read that a firm such as Goldman Sachs has made very large profits from having devised ways to spot and carry out favorable transactions minutes or even seconds before the next most clever competitor can make a move. Deep pockets in a large market can make a lot of money out of tiny advantages. (Of course, if you have any such advantage the temptation is irresistible to borrow a lot of money to enlarge your bets and your profits. Leverage is good for you, until it isn’t. It is not so good for the system.) A lot of high-class intellectual effort naturally goes into trying to invent ways to find those tiny advantages a few seconds before anyone else. If that suspicion is valid--I emphasize that the necessary calculations have not been made and will be hard to make--the conclusion would be that our poorly regulated financial system is not only dangerously unstable, but also too big and too complex, absorbing talent and resources that could be better used doing something else. What is inadmissible is the assumption that, if the market creates a large and convoluted financial system, the market must be right." Note: This post is the thirty-fifth in a series. Click here for the full listing of the series. I've talked a few times about the notion of trade being a win-win (pareto-efficient), and how the first welfare theorem of economics talks about how under conditions of perfect competition, nobody can be made better off without anyone being made worse off. In my readings on economic topics, I find that people often therefore regard anything that interferes with perfect competition as a bad thing. Additionally, it is common to see people discuss markets as though they were in a mostly static state, where all that could vary was the price charged by a company, and that competition consisted solely of price competition1. In this post I want to highlight how capitalism itself, at its core, depends, and is in some ways defined by beneficial breaches to conditions of perfect competition. Creative destruction is the process by which innovation (e.g. competition on some basis other than price) upsets the balance of a market. More accurately, it is not that innovation upsets a balanced competitive market, but rather that ongoing innovation prevents most markets from ever even approaching the notion of prefect competition in the first place. Unlike the case of a typical trade which is a win-win for all involved, creative destruction is an inherently competitive process meaning that it creates both winners and losers. a social movement of British textile artisans in the early nineteenth century who protested—often by destroying mechanised looms—against the changes produced by the Industrial Revolution, which they felt were leaving them without work and changing their entire way of life. It wasn't just that they 'felt' that way, their way of life really was threatened by the innovation and price competition underway in their industry. You don't see a lot of textile artisans around nowadays. Capitalism, then, is by nature a form or method of economic change and not only never is but never can be stationary. And this evolutionary character of the capitalist process is not merely due to the fact that economic life goes on in a social and natural environment which changes and by its change alters the data of economic action; this fact is important and these changes (wars, revolutions and so on) often condition industrial change, but they are not its prime movers. Nor is this evolutionary character due to a quasi-automatic increase in population and capital or to the vagaries of monetary systems, of which exactly the same thing holds true. The fundamental impulse that sets and keeps the capitalist engine in motion comes from the new consumers, goods, the new methods of production or transportation, the new markets, the new forms of industrial organization that capitalist enterprise creates. As we have seen in the preceding chapter, the contents of the laborer's budget, say from 1760 to 1940, did not simply grow on unchanging lines but they underwent a process of qualitative change. Similarly, the history of the productive apparatus of a typical farm, from the beginnings of the rationalization of crop rotation, plowing and fattening to the mechanized thing of today–linking up with elevators and railroads–is a history of revolutions. So is the history of the productive apparatus of the iron and steel industry from the charcoal furnace to our own type of furnace, or the history of the apparatus of power production from the overshot water wheel to the modern power plant, or the history of transportation from the mailcoach to the airplane. The opening up of new markets, foreign or domestic, and the organizational development from the craft shop and factory to such concerns as U.S. Steel illustrate the same process of industrial mutation–if I may use that biological term–that incessantly revolutionizes the economic structure from within, incessantly destroying the old one, incessantly creating a new one. This process of Creative Destruction is the essential fact about capitalism. It is what capitalism consists in and what every capitalist concern has got to live in. Every piece of business strategy acquires its true significance only against the background of that process and within the situation created by it. It must be seen in its role in the perennial gale of creative destruction; it cannot be understood irrespective of it or, in fact, on the hypothesis that there is a perennial lull. The first thing to go is the traditional conception of the modus operandi of competition. Economists are at long last emerging from the stage in which price competition was all they saw. As soon as quality competition and sales effort are admitted into the sacred precincts of theory, the price variable is ousted from its dominant position. However, it is still competition within a rigid pattern of invariant conditions, methods of production and forms of industrial organization in particular, that practically monopolizes attention. But in capitalist reality as distinguished from its textbook picture, it is not that kind of competition which counts but the competition from the new commodity, the new technology, the new source of supply, the new type of organization (the largest-scale unit of control for instance)–competition which commands a decisive cost or quality advantage and which strikes not at the margins of the profits and the outputs of the existing firms but at their foundations and their very lives. This kind of competition is as much more effective than the other as a bombardment is in comparison with forcing a door, and so much more important that it becomes a matter of comparative indifference whether competition in the ordinary sense functions more or less promptly; the powerful lever that in the long run expands output and brings down prices is in any case made of other stuff. It is hardly necessary to point out that competition of the kind we now have in mind acts not only when in being but also when it is merely an ever-present threat. It disciplines before it attacks. The businessman feels himself to be in a competitive situation even if he is alone in his field or if, though not alone, he holds a position such that investigating government experts fail to see any effective competition between him and any other firms in the same or a neighboring field and in consequence conclude that his talk, under examination, about his competitive sorrows is all make-believe. In many cases, though not in all, this will in the long run enforce behavior very similar to the perfectly competitive pattern. I haven't really made the connection with ethics clear so far, so a few comments on that may be in order. First of all, Jane Jacobs contrasted the desire for innovation under commercial ethics with respect for tradition, so this is another confirmation of that split. Secondly, there is the recognition that the process of the market is not a pareto-optimal, win-win one where there are no losers and nobody has any real reason to complain, but rather is a competitive one where the essence of the system is people making voluntary transactions that have significant negative repercussions (externalities) for parties not part of the transaction (e.g. your boss and an Indian worker agree that your job will now be done in India). The fact that we don’t suffer from more Luddite style violence, reflects that society makes an effort to assist those blown over by the gale of capitalism and, related, that a critical mass of people feel they have more to lose from fighting the system than by going along. Also, the process of innovation itself relies heavily on the ethics that Jacobs outlined. Optimism to make one believe that the untried plan will work and a willingness to be thrifty and productive in order to save the resources that will be used to make the productive investments needed. 1 In economics, but not in business books where simple models such as Porter’s Five Forces model present a more realistic assessment of the situation and discussion of pricing in the context of business strategy. "Is our government still operational? I know it is dysfunctional, but what is going on now?" "Our government is extremely operational! We’ve shut down time-wasting debate so the government can get to its top agenda items faster, such as stacking the senate, and not be bogged down with the minutia of some brown people being tortured on the other side of the planet. Hooray for our government! Hooray for the Action Plan!" "Oh good, no reason to worry then. Sounds like everything's under control!" Here's a chart from the U.S. federal reserve that Paul Krugman mentioned the other day. 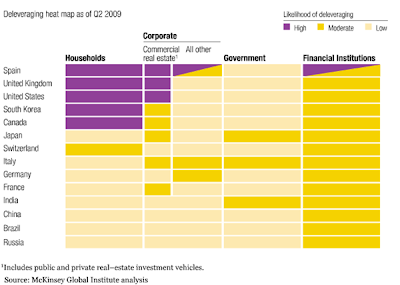 The Fed included the chart as evidence that monetary policy wasn't the cause of a U.S. housing bubble. Krugman was pointing out in response that you can't use a national average change in housing prices all that meaningfully for a country like the U.S. since, unlike other countries that had bigger national changes, the U.S. had a mix of high-growth bubbly areas and small-growth no-bubble areas. As a Canadian, I noted that the growth in housing prices was higher in Canada than the U.S. over the period covered, and that the same logic regarding only part of the country having the big house price changes applied here as well. But what worried me was something else. 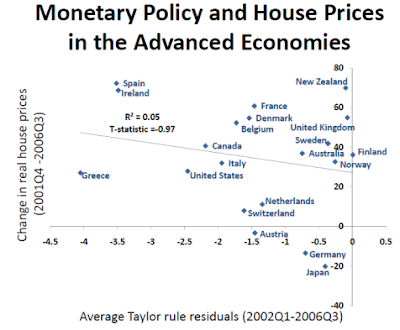 The x axis on the chart is the Taylor Rule residual, or how interest rates, as set by the central bank, varied vs. what a rule-of-thumb known as the Taylor rule would suggest they should be. I'm not going to get into the technical elements of how the Taylor Rule works, the point is that the U.S. Fed used this metric in the chart as a rough measure of how 'easy' monetary policy was over the period. One concern with 'easy' policy is that by keeping interest rates below what they 'should' be, the Central bank might foster an unsustainable credit/asset price bubble that would be followed by a crash. Greece: "Moody's cut Greece's debt to A2 from A1 on Tuesday over soaring deficits, becoming the third major rating agency to downgrade the highly-indebted country's rating this month." Spain: "The weaker euro economies such as Spain and Greece have been terribly hit by the crisis, and experts blame the euro, at least in part, as European Monetary Union (EMU) members cannot use national monetary policy as a crisis-fighting tool." Ireland: "How close is Ireland to crisis? Close enough that prominent people are raising the spectre of capital account flight already underway." "The United States: Aughts were a lost decade for U.S. economy, workers"
So who's in fifth place, behind arguably the 4 countries hardest hit by the global financial crisis? Canada. But don't worry, it's different here - I hope. Note: This post is the thirty-fourth in a series. Click here for the full listing of the series. The Bourgeois Virtues, by Deirdre McCloskey is a wide-ranging, 500+ page book, and in this post I'm just going to pick out a few points that I found interesting and/or relevant to the current exercise. 1) Ethics cannot be reduced to a single measure of goodness or utility or simple self-interest that would allow a one-dimensional analysis to be carried out. Instead, McCloskey believe there are seven primary virtues: 4 pagan virtues (Courage, Temperance, Prudence and Justice) and 3 Christian virtues (Love, Faith and Hope). Like primary colours, these 7 can be mixed to form the other virtues. For example, honesty is said by McCloskey to be a combination of courage, justice and faith. To be honest, it feels a bit like the seven virtues are being stretched to meet other notions here. It seems a bit like saying nothing at all to say that the Bourgeois virtues are the same as the virtues that exist in the rest of life as if there were no difference in the virtues of a businessman or a knight or samurai warrior, as if there was never a difference between the commercial culture of the Northern United States and the feudal culture of the South. .. there is general agreement between Jacobs list and the descriptions of the uses of the seven virtues in McCloskey's description. One exception is that McCloskey says that faith, to sustain traditions of commerce is a commercial virtue, but it seems unhelpful to say that innovation and respect for tradition are both commercial virtues. One interesting component of the book is that because McCloskey is a believer in a system of more than one virtue, she includes a number of lists of virtues compiled by herself and others. On page 408, there is a list of 'Prudence/Profane' and 'Solidarity/Sacred' variables where the 'P' list corresponds to what we might call more practical notions and the 'S' list is more 'romantic' notions. The Care list is the domain of the 'care economy' with a primary virtue of 'benevolence/love', values relate to 'relationships', others are perceived as 'different', rewards are 'intrinsic' and the relation to others is 'interdependent'. The spheres correspond to 'agora', 'polis' and 'oikos' in the Greek, and 'Liberté', Egalité', 'Fraternité' in French. Anyway, I realize this isn't a great summary, but in some ways the whole point of McCloskey's rambling, meandering, 500+ page book is that virtue is not something to be easily summarized, so perhaps my lack of a concise summary is unsurprising. I guess you can read the book for yourself1. What I took from the book is that other people who have studied virtues long and hard have come to some broadly similar conclusions as Jacobs regarding what belongs in the commercial set of ethics and what belongs outside, although the analysis here is not as clear as Jacobs', and certain other concepts such as the corruption caused by mixing ethics from different systems are missing. For example, on page 296, McCloskey suggests that honesty, as the master commercial virtue has replaced honour which was the master virtue under an aristocratic system. It doesn't occur that the two virtues might co-exist in their respective areas of appropriateness, and what has changed is not what is virtuous behaviour but the type of activity that is most prevalent among those writing books about virtues. 1Although if you do read it I recommend skipping the first hundred pages or two and a number of later sections where McCloskey endlessly attempts to explain why Bourgeois is not a synonym for evil, relying mostly on the sort of simplistic 'markets trump communism', 'level 2 beats level 1' kind of argument that I discussed back here.